The Marshall Family built top quality yachts - the Californian and the Navigator - for over forty years. Wonderful yachts with solid fiberglass hulls, built with the rigors of the Pacific Northwest in mind. 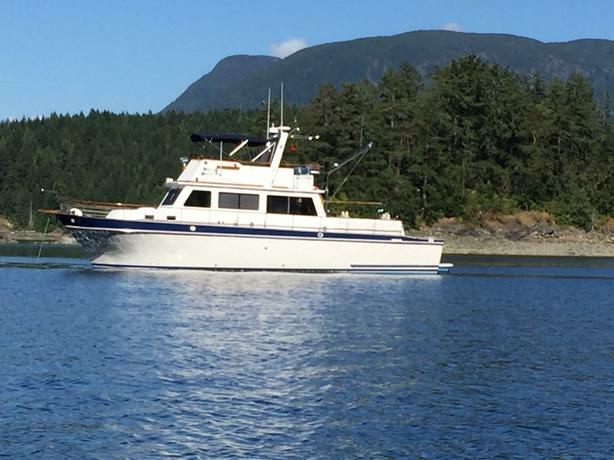 From this tradition came "Continuance" a 1983 Californian 50 Long Range Cruiser. The past owners have spared no expense in maintaining Continuance to a high standard. For a great cruiser or a marvelous live aboard; come visit Continuance. Entering is from the swim platform through a locking gate onto the stern deck, then along the starboard side walkway to the full size entrance door. The walkway is wide enough to walk comfortably and is guarded by a waist high teak railing set on solid stainless steel posts. Upon entering the yacht one is struck by the brightness & visibility. Large windows on the port, starboard & above the helm fill the salon, galley and the helm with natural light. One immediately gets the feeling of wow! What a cozy, comfortable place to be! To left, is the salon/dining area with an L shaped blue leather sofa wrapped by large windows. Ahead to the right side, is a full - let's get cooking galley. Directly right, is the helm with a large high back leather helm chair and all of the electronics and controls required for safe cruising. A few short steps up the stern port side leads to a door and the tender deck. Down a few steps and you're into the master cabin with private head and shower. A queen size bed with access from either side dominates the cabin. As with the rest of the yacht ample storage is discreetly placed all around. Returning forward past the helm, down a couple steps are the second head, guest cabin, and VIP V-Birth cabin. Access to the engine room is through a hatchway revealed by lifting the stairs to this area. More pictures and specs can be seen on our website, linked in the box below.